By default, all action commands are set to Discover action settings (the Discover action check box on the Action tab is checked). The action settings will automatically be configured when you execute the command the first time. The default action settings are usually quite sufficient, so you will rarely need to worry about the Action configuration tab at all. However, you can fine-tune the action settings to achieve better performance, and you may need to adjust the action settings to get the command working correctly. After choosing a New Command type from the drop-down in the Configure Agent Command panel, click the Action tab. By default, all action commands are set to automatically discover action settings when you execute the command for the first time. The settings are usually suitable for most scenarios, so you will rarely need to worry about the Action configuration tab at all. After some experience, you may want to fine-tune these settings to achieve better performance, and sometimes it may be necessary to adjust the action settings to get the command to function according to your precise requirements. •Action - Specifies the type of action, which can be a Fire Event, URL, or No Action. Not all action types are available for all action commands. •Browser - Specifies the web browser in which the new content should load. •Events - For action set to Fire Events only, this is a list of events that will fire on the chosen web element. 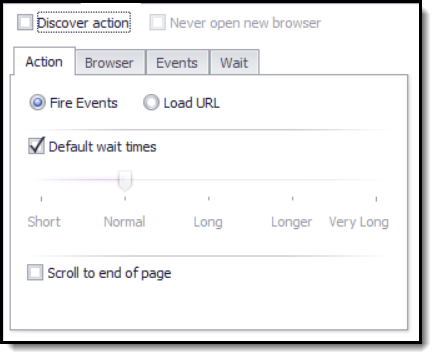 •Wait - Specifies the browser activities for which the command will wait before the action is complete.